Bits and Pieces - Life-sized Rooster on the Farm - Metal Garden Sculpture - Our Metal Rooster Is Perfect for Home and Garden Décor - Metal Garden Art, Outdoor Lawn and Patio Decor, Backyard Sculpture. Hand crafted from metal, our majestic life-sized rooster and chicken sculptures are the perfect accent for your yard or garden. These barnyard sculptures feature delightful personalities with generous flowing metal tail feathers. Each is airbrushed and hand painted with colorful markings in red, orange, golden yellow, and hunter green. Legs stand on a sturdy U base for placement on uneven surfaces. Rooster stands 21-1/2" high x 19" long. 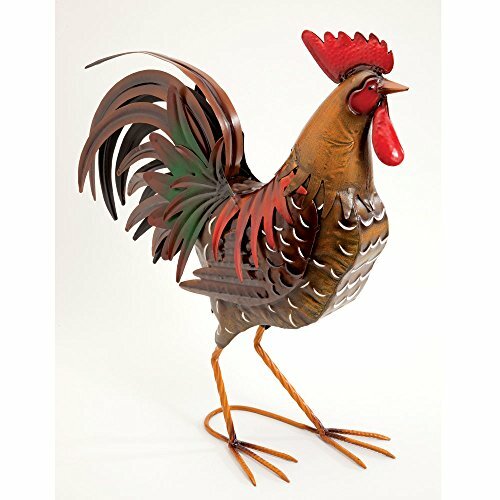 Hand crafted from metal, our majestic life-sized Rooster sculpture is the perfect accent for your yard or garden. This barnyard sculpture features delightful personality with generous flowing metal tail feathers. This rooster is airbrushed and hand painted with colorful markings in red, orange, golden yellow, and hunter green. Legs stand on a sturdy U base for placement on uneven surfaces. Rooster stands 21-1/2" high x 19" long. Deco 79 Metal Flamingo Statue (Set of 2), 28"/32"